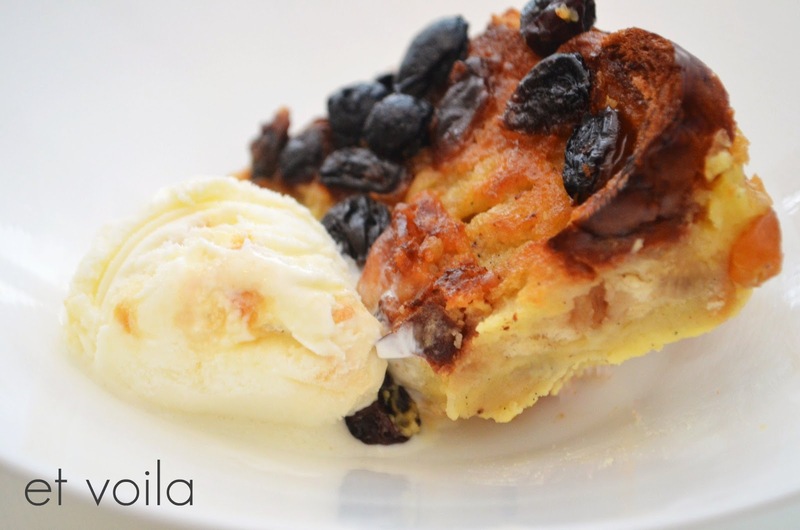 While I still cringe at fruit cake and pass on Christmas pudding, one English dessert I have come to admire is Bread and Butter Pudding. For starters, what is not to love about bread and butter? This is a dessert that pleases all ages, requires little prep and can be made ahead of time. Chef’s recipe follows, with a few extra ingredients to enhance this English classic. Put milk into a small pan with the vanilla pod. Bring to a gentle boil, turn off the heat, add the lemon zest and allow to cool. Butter baking dish and arrange 4 slices of panettone in overlapping rows inside. Slice butter and place half of portion in between slices of bread. Beat the eggs together with the sugar until well mixed. Remove the vanilla pod from the milk and discard before stirring in the milk and the cream into the egg mixture. Add in the rum. 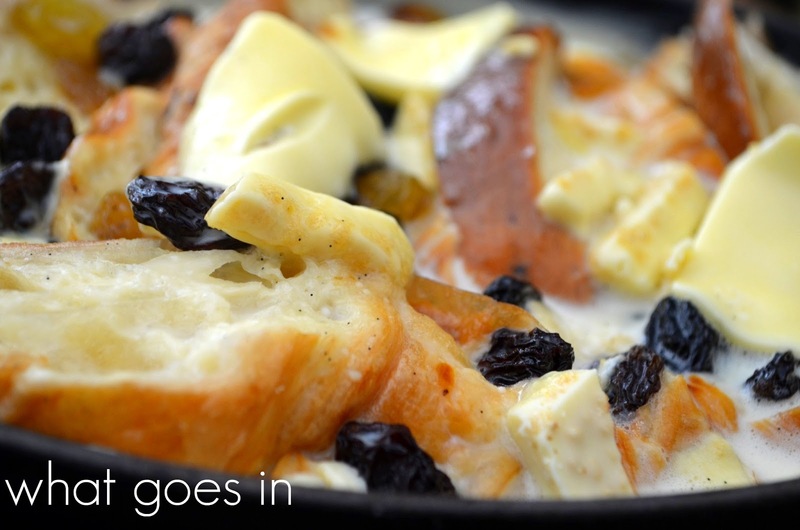 Pour a little more than half of custard over the bread and sprinkle half of dried fruits. 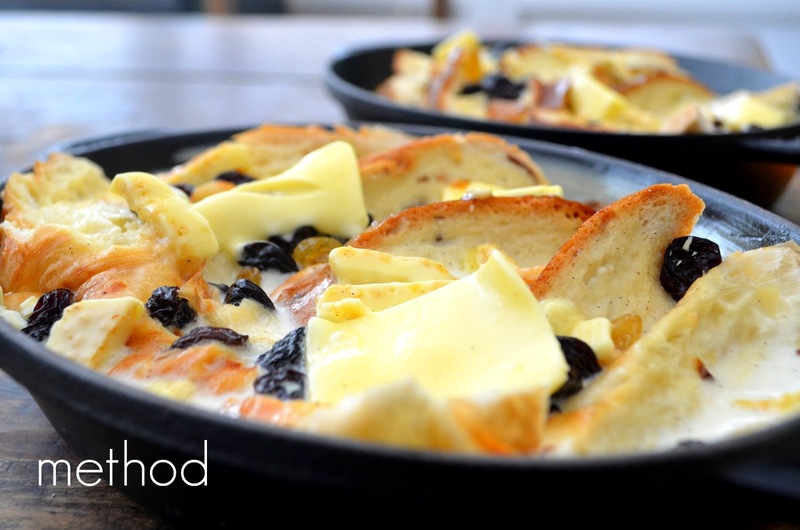 Arrange the rest of the bread in a second layer in the baking dish and drizzle over the rest of the custard. Dot with the remaining butter, raisins and cherries. Cook for 20 minutes or until set (golden brown in colour). Coat with marmalade and run under the broiler to caramelise. The pudding may be cooked ahead and reheated in oven before serving. Above served with clotted cream ice cream with honey comb. If prefer, vanilla bean ice cream or custard may be served with pudding. Leftovers, if any, make a delicious breakfast treat with morning coffee, too! DELISH! Please send me a bowl full, and I'll plop some Blue Bell Natural Vanilla Bean on top. Yummy.